Yesterday Ben had to help me make cookies for 'school'. Pete found a really good recipe online, and Ben helped mix by "spinning the bowl" (even though it spins on its own). Then he helped "clean" the beaters.. and after it was all clean - he even let Tally take a turn at "cleaning" it. We cut some hearts for valentine, and we cut some moons b/c they are Ben's favorite (they taste better you know). 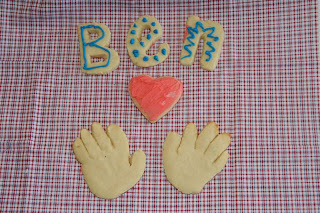 We even ditched the cutters and cut out some Ben hands, and made little cookie bugs. 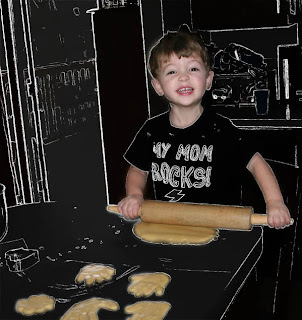 He loves to bake, especially when it includes thinks like cookies and icing. your mom does rock Ben!! and so do you!!! Those are ADORABLE!!!!!!!!!!!!!!! I love the second pic -- the outlines are awesome! But SOOOOOOOOOO adorable!!!! !